new web page or add the form to an existing web page. 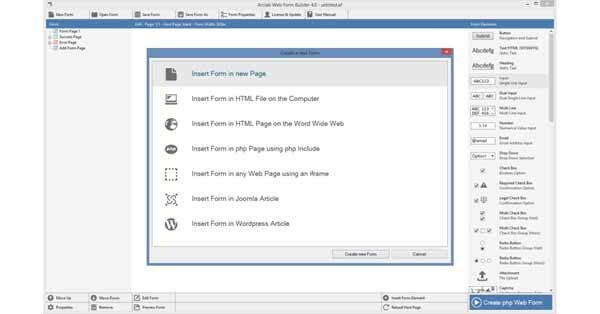 The software supports multiple ways to add a form to your host page: load a HTML host page directly into the program, add an iframe to your page or use “php include” to include the form to an existing php page. Builder also includes a built-in multi-style “Captcha” as challenge-response test to ensure that the form was filled out by a human and not by a bot. Arclab Web Form Builder creates a single php file containing the complete form and processing code. Just upload a single php file to your web site even if you have created a complex form with multiple pages. There is no additional installation on the web server required. The script uses php (version 5 or newer) which is running and pre-installed on most web sites. The generated form is based on HTML and will work with all browsers on computers and mobile devices. It also works if cookies are disabled in the web browser (no cookies required). Just open the uploaded web form in your browser and the php script displays the form. It generates an email out of the submitted form content after the user hits submit on the (final) form page. The form submission can be mailed to a single or multiple recipients in text, HTML or XML format. An optional autoresponder or custom message can be sent to the person filling out the form. The web form and also the email are in utf-8 format, which supports all languages and international characters. The form results will arrive directly in your inbox after the form was submitted.